The selection of videos in Human Beyond a Cure, offer frank and poignant reflections on living in a culture that is simultaneously preoccupied with self-help and self-destruction. Cam Matamoros’ In Four Years earnestly takes on a practice of goal setting and positive self-talk, while Daniel Barrow’s Artist Statement exposes the meaninglessness of success and art stardom. Both Subtitled and We Belong Together illustrate the inextricable influence of pop culture on our desires for intimacy and connection. Hannah Jickling and Kevin Hegge challenge the hetero-normative status quo in Knee for All, which celebrates the taboo of asexuality and radical desire. Shana Moulton’s Whispering Pines #4 makes an unapologetic leap into the quagmire of consumption based ‘healing’ modalities and their aesthetics, and Nina Yuen’s Alison takes us deep into the woods, down deserted highways, and into the psyche of a lost woman. The program’s namesake Songs of Praise for the Heart Beyond a Cure strings together a series of uneasy lullabies that neither assuage our fears of the world’s end, nor secure our hope in finding a cure for being human. Daniel Barrow, Artist Statement. 2006, 5:30mins, Canada. Cam Matamoros, In Four Years (adjectives and adverbs). 2007, 5mins, Canada. Shana Moulton, Whispering Pines #4. 2007, 12mins, USA. Benny Nemerofsky Ramsay, Subtitled. 2004, 2mins, Canada. Goody B. Wiseman, Keeping Her Cool. 2002, 3:50mins, Canada. Hannah Jickling & Kevin Hegge, Knee for All. 2007, 4mins, Canada. Leah Glushien & Maiko Tanaka, We Belong Together. 2007, 3:45mins, Canada/USA. 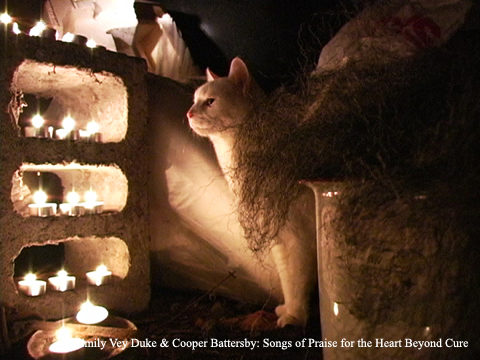 Emily Vey Duke & Cooper Battersby, Songs of Praise for the Heart Beyond Cure. 2006, 15mins, Canada/USA.